After our wonderful lunch at Barking Frog we headed off for our quick drive to Chateau Ste. Michelle also located in Woodinville, WA. Chateau Ste. Michelle is the main Washington winery which really helped to put WA on the map for Merlot. They are still the largest wine producer in their state. We were fortuitous to meet both Ted Baseler the President and Keith Love the Vice President of their company. Ted Baseler was the only one of the two filmed for our interview. Keith Love did listen in and watch as the interview took place. Ted Baseler was a nice clean cut kind of guy. He is a great speaker and was able to give us a better understanding about the marketplace of Merlot past-present- and possibilities of the future. It was interesting to learn that in general Washington state did not notice a drop in Merlot sales after the movie Sideways. They actually had an increase in Merlot sales. Later on in the week we got the same response from who we interviewed, most of which were smaller productions. At the end of the interview, Keith kindly sent us off with 6 of their various wines. Before we left, he also led us to a private tasting room in order for us three (Me, Rudy, & Chris) to sample some of their other numerous wines that they produce. It is important to mention that a few years back when there was a devastating frost that damaged many vineyards in Washington State, Chateau Ste. Michelle stood up and basically helped all of her friends by allowing smaller Washington State wineries to buy some of their grapes for that particular harvest/vintage. This love shown was an everlasting effect and only made the Washington wine industry bond stronger. We were quite amazed to hear such a large company to go out of their way to help their neighbors. This alone can give you an idea of what the Washington State wine industry is all about. I also want to mention that Chateau Ste. Michelle is located on beautiful grounds that are obviously manicured. They are also lucky to have an outdoor stage where they hold concerts. Maybe in the near future we will have a screening of Merlove there? Chateau Ste. 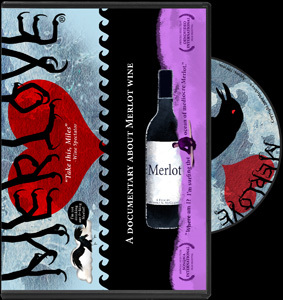 Michelle has also generously offered to sell the Merlove DVD when available. Later this day Chris Jones-Marino (our cameraman) took us to a cupcake & coffee house located in Madrona. It was one of his favorite hang-outs when he lived in Seattle. For dinner that night, we met with a couple of his old friends at Presse, a French cuisine restaurant. It was a very hip and chill place to eat. Merlove on Gary Vaynerchuk’s Wine Library TV! Cheers to a Successful Merlove Premiere!